The French Alps are famed for their skiing. From charming alpine villages, to skiing the huge Alps, France is an amazing place to plan a family ski holiday. 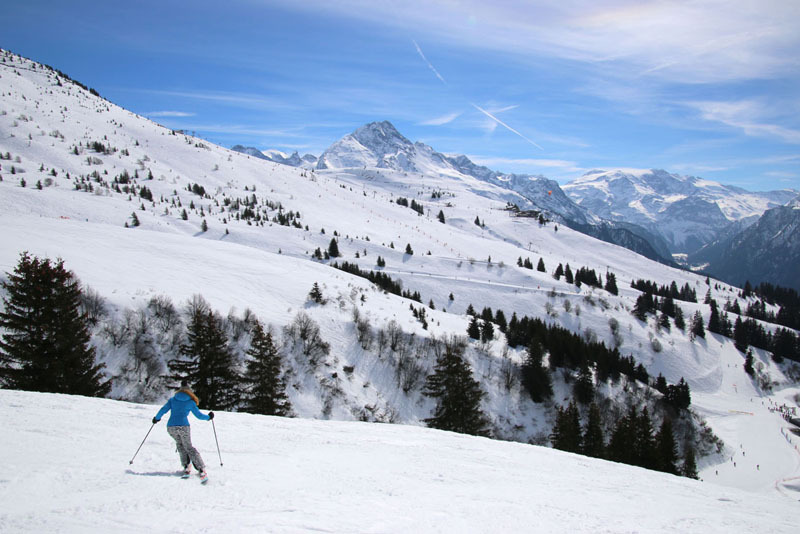 Huge ski resorts like Les 3 Vallées – the largest interconnected ski resort in the world – offer 100s of miles of groomed trails, high capacity trams and gondolas, terrain parks and some of the best ski schools anywhere. See our Reviews of The Best Ski Resorts in France for planning your family ski vacation, your guide to high alpine skiing, French food, mountain hotels, plus fun things to do after skiing – from elaborate waterparks, to old fashioned sledding, and exploring historic ski villages. Parents can enjoy French après ski, while kids play in the snow, sled or build a snow man. Courchevel is part of Les Trois Vallées Ski Region, along with Val Thorens and Méribel. Les 3 Vallées is a fantastic resort destination for families – staying in the charming Savoyard village of Courchevel 1850 is very upscale – this is where the rich and famous Europeans ski. Yet families will find delightful Fun Family Zones on the ski slopes, and Aquamotion – a grand waterpark for great fun in the afternoon. Méribel is perhaps France’s most well-designed ski resort in the heart of Les Trois Vallées, so you can easily reach all the ski slopes via the efficient lifts. Val Thorens is the largest of the 3 Valleys and therefore the most affordable for lodging options. Le Grand Massif is the 4th largest ski resort in France, 5th largest in Europe, located in the Haute Savoie of France. This ski resort was formed in 1980 as a region combining 5 ski areas, Flaine, Les Carroz, Morillon, Samoëns and Sixt Fer à Cheval. Hence the translation of Grand Massif- the big big, with skiing on 77 lifts, and 165 miles of skiing. Families will like the affordability of Grand Massif, and the convenience – just an hour from Geneva. See our reviews of the skiing and mountain lodging of Grand Massif. Val D’Isère and Tignes, also called L’Espace Killy for the famous French ski racer Jean Claude Killy, has over 300 kilometers of skiing including two resorts all interconnected by 70 lifts. Val D’Isère is home to some of the most famous ski terrain of the French Alps like the men’s Olympic Downhill Bellevarde Face. Val D’Isère’s village is more historic than Tignes, medieval even, and the shopping, après ski, and French cuisine are impressive too – very Savoie. Paradiski includes La Plagne and Les Arcs – the second biggest linked ski resort in the world, behind Les Trois Vallées. Paradiski includes skiing on two glaciers, 425 kilometers of skiing, and a highest elevation at Aiguille Rouge of 10,583′. While the architecture is not your anticipated alpine charm, ski and stay deals abound at La Plagne and Les Arcs several ski in ski out villages, and the vast ski terrain and scenery will satisfy everyone in the family. France hosted the first Winter Olympic Games in Chamonix in 1924, Grenoble in 1968 and Albertville in 1992, and continues to host annual World Cup ski events as well as fun family festivals all winter long. See our French Alps Ski Videos and our Top Family Ski Resorts in The French Alpsfor planning your French family ski holiday.